Another CRL title for the archives, and in the shape now of Pete Cooke’s simulation game – Juggernaut. 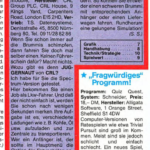 This was mentioned in an small review in Aktueller, 05/1986 – where the C64 version is listed as a format. Only the Spectrum and Amstrad editions were to surface however. It is possible that there were problems with a C64 conversion, which was something that cursed many of the CRL titles currently in the archive. If anything was started, how far did it get? More information needed – can you help?